Recently a picture of next flagship of xperia Z series was leaked showing us the fingerprint scanner of the device. Today another image of next flagship of xperia Z series was leaked by Vizileaks. This should be definitely Xperia Z5 and Xperia Z5 Compact. We can see some detailed info from this leaked photo. 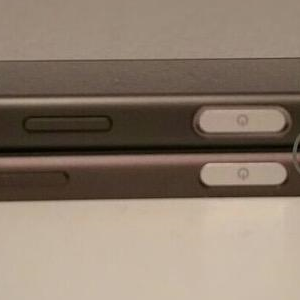 From the photo we can understand the fingerprint scanner is on the right side and the volume rockers has gone to below. As the volume rockers of Xperia Z5 Compact has gone so lower it would be difficult to reach it when using the device. Any info about Xperia Z5 Ultra has not been leaked.